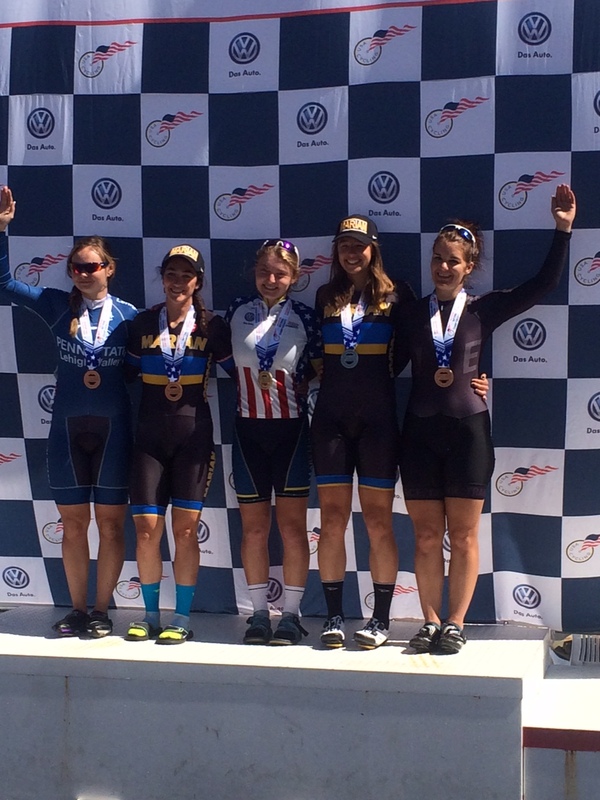 Josie Ritchie wins National title in women’s 500m TT, team brings home bronze!!! 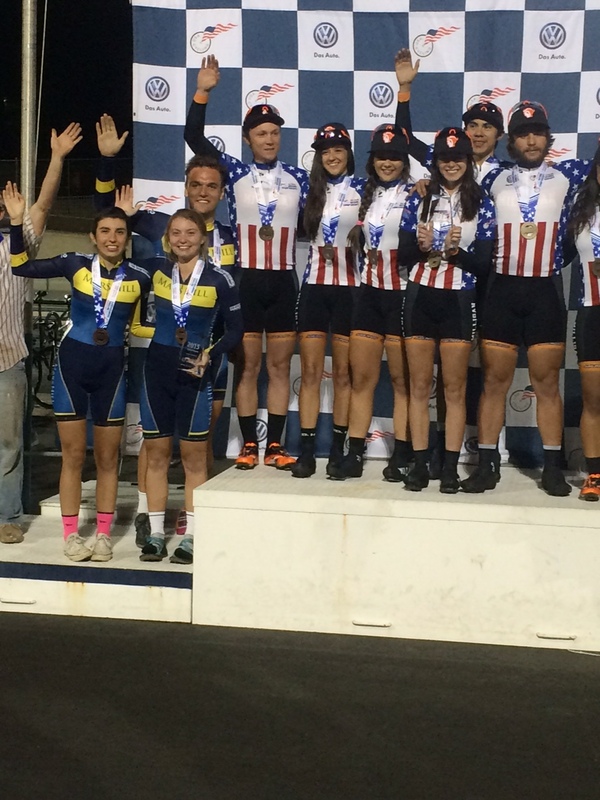 The team of Alex Christofalos, Josie Ritchie and John Croom opened the event on Thursday with Josie Ritchie racing in the women’s Sprints. She faced very experienced and fast girls all morning in qualifying heats and made it all the way to her quarterfinal ride where she was just edged out and missed the cut for the podium races. She made it into the 5-8th place final that was to be held the next evening where she placed 8th. Friday kicked off with wind gusting upwards of 30mhp and temps in the mid to upper 40’s. But the team was there to race and very pumped to get on the track and show what they’ve worked all year towards. The morning kicked off with Alex Christofalos in the women’s individual pursuit 3k, she battled with everything she had and was able to lock down the 22nd place finish in a time of 4:24.486. Next up was John Croom in the men’s individual pursuit 4k. After a fast start he found his rhythm and just missed out on the podium with a 6th place finish in the time off 4:47.216. Later on that evening the men’s and women’s points race took place. In a large 30 rider field Alex Christofolas rode a great race and ended up in 16th place to round out a great day of racing by all. Saturday was the third and final day of racing with the men’s 1k TT and women’s 500m TT as well as men’s and women’s scratch racing. John Croom was ready to go for his 1k and rode amazing effort that landed him on his first collegiate national championship podium in a personal best time of 1:06.763 good enough to take the 4th place spot. Next up was Josie Ritchie in the women’s 500m TT. In the very last heat she rode out of her mind and took the win and her first ever track national championship title in the time of 37.583 seconds. But even with all the great results that far in the day, the competition wasn’t done yet with both the men’s and women’s scratch races still to run. In the women’s event Alex Christofolas was able to muscle her way around the large field and pulled down the 14th place with Josie Ritchie claiming the 34th position. Our last event for the 3 days was with John Croom in the men’s scratch race. He rode a brilliant race and was just in the wrong place at the wrong time and was pushed up track and unable to make the final move and ended up placing 10th out of the 45 rider field. After three days of action packed racing it was time to total up the team scores for the event. Coming in with only three riders we knew that it would take a complete effort to pull on a team medal when teams we compete against bring 10-20 riders and race every event. But with that being said and against all odds we brought home the bronze medal in the division 2 team classification. All in all the team had 5 top 15 places, 2 national championship individual medals, 1 individual national champion and a 3rd place team medal. Many lessons were learned and once in a lifetime experiences had, the season ended on an amazing note and excitement for next year already growing.